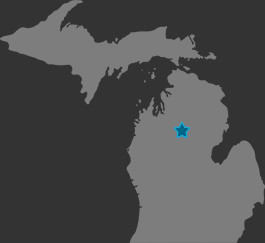 Enjoy fishing on Houghton Lake, Higgins Lake or Lake St. Helen on open water or the ice. If you are lucky enough to catch tagged fish, adult anglers become eligible to win $100,000.00 in cash and a brand new Lund Boat package from Spicer’s Boat City*. Youth anglers (17 and under) become eligible to win a $250 cash prize and a new kayak from Simple Adventures. ** All anglers catching a tagged fish receive a $50 gas card. Big Wally XIII and more than 200 of his closest friends (blue gill, pike, bass, crappie or perch) have been released into Michigan’s Other Great Lakes. 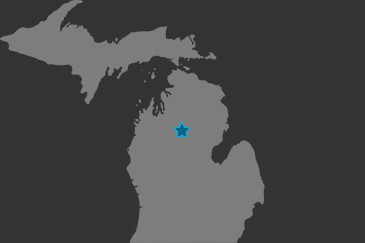 The contest is open to adults holding a current Michigan Fishing License and anglers under 17. 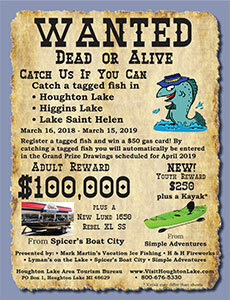 Just bring your tagged fish to Lyman’s on the Lake in Houghton Lake; H&H Fireworks, Houghton Lake; Korbinski’s Marine, Prudenville; West Higgins Lake Hardware; or Trails End Motel, St. Helen for verification and you will be entered in the finals for a chance at $100,000.00 and the Lund boat package from Spicer’s Boat City. *For adult anglers, $100,000.00 prize and Lund boat package will be awarded based on selection of two matching envelopes out of 20. 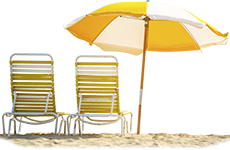 Minimum prize will be valued at more than $1,000.00. 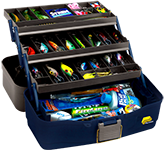 Each lucky fisherman will choose a tackle box in order of the date on their verification form. One key will open a treasure chest containing 20 envelopes. 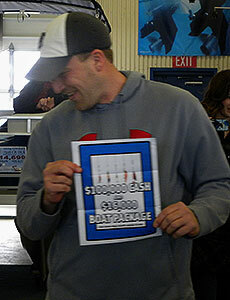 Two matching envelopes must be drawn to win the $100,000.00 grand prize for the lucky angler. 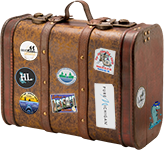 Minimum prize value in the treasure chest will be $1,000.00 CASH. ** One Youth angler $250 prize and kayak will be awarded based on a drawing. 1. 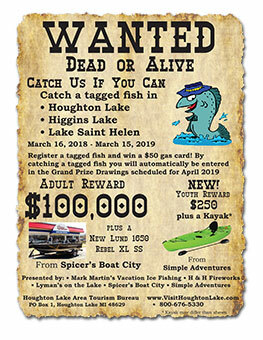 Go fishing on Houghton Lake, Higgins Lake or Lake St. Helen between March 16, 2018 and March 15, 2019. 3. 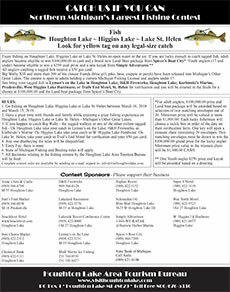 If you happen to catch Big Wally - the tagged walleye or any of the other yellow tagged fish - On Houghton Lake take your catch to Lyman’s on the Lake; H&H Fireworks; or Korbinski’s Marine. On Higgins Lake take your catch to W. Higgins Lake Hardware. On Lake St. Helen, take your catch to Trail’s End Motel for verification and your $50 gas card. 7. All decisions relating to the fishing contest by the Houghton Lake Area Tourism Bureau will be final.